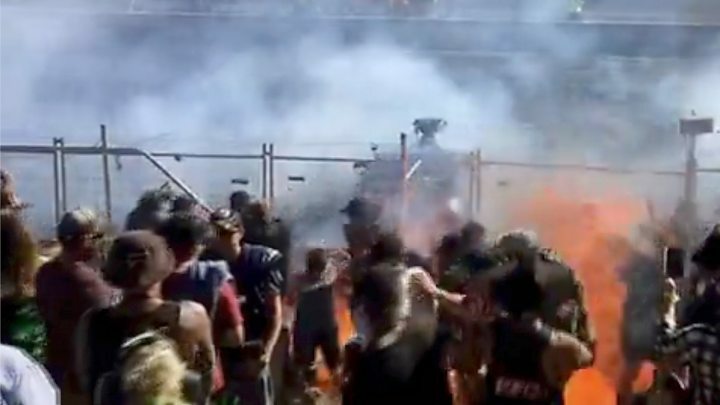 Twelve people have been injured after a car sprayed burning fuel over fans during a burnouts competition in central Australia. The incident at Red CentreNATS - a popular festival of drag racing and other motoring activities - sent lit fuel into the crowd in Alice Springs. Footage showed flames reaching spectators and people scrambling away. Eleven of the 12 people treated were taken to hospital on Sunday. One man, 47, suffered critical injuries. He was flown to the Royal Adelaide Hospital with burns to about 20% of his body, the Royal Flying Doctor Service said. Eight people, including the man's 19-year-old son, remained in a stable condition in hospital on Monday. Two patients had been released. The incident took place during a burnout competition, a Red CentreNATS spokeswoman told the BBC. Organisers shut down the event following the incident, which is being investigated by police. "This is a distressing situation however all patients are receiving the care they need," Red CentreNATS said in a statement. Last year, about 14,000 motoring enthusiasts attended the event billed as the "Ultimate Festival of Wheels".